I will update this recap more tomorrow morning, but I wanted to get home after the jersey auction and post the bid totals for all the fans out there. The Stars won their second straight game at home, shutting out the Team USA U-17 squad, 2-0. 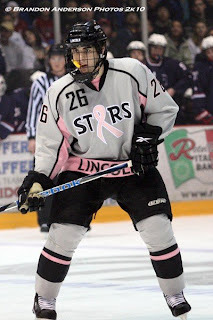 Scoring goals for the Stars were forwards Ryan Dzingel (PP) and Tyler Deresky (SH). Stars goaltender Matt Green recorded his second straight shutout, stopping all 24 shots he faced. According to Stars radio announcer Mike Melbye, Green became the fourth Stars goaltender in franchise history to record back-to-back shutouts. The other three Lincoln goaltenders to record back-to-back shutouts were Beau Fritz, Jean-Philippe Lamoureux, and David Reekie. Stars outshot the U-17 squad, 39-24. I was jotting down the totals throughout the auction, so I hope my numbers are correct. It was great to see so many fans stick around after the game and participate in the auction. Great way to end another magical night at the IceBox. I will update this article tomorrow morning. Time for sleepy. Thanks McCarron, American Idol is calling, your the best! I got to meet a couple of my favorite players moms, it was a pleasure. That along with the win made it a 5 star weekend! Is it too much to ask for 1 more win? Selfish it might be, but damn one more choo-choo would be awesome! Anyone know where Reekie is? tried to look him up and couldn't find him, don't tell me he isn't playing anymore, that would be heartbreaking! Thanks Yeti, for the info and this awesome place to talk about our favorite hockey hero's! only third time this year, (last was last october and november) that the stars won 2 in a row. Another stellar performance last night boys!! Great game and awsome auction afterwards, thanks to all the fans that bought jerseys! And again best fans in the ushl! Had fun at the auction. Just want to wish Pete's dad a happy 50th b-day from your friends in section "K"!!! Really nice to meet your wife last night! Been fun seeing all the parents the last couple weeks. Hope to see all of you at try outs!! Great weekend of hockey!! Good job guys! Really great that the rest of the non-hockey community in this area can see on the LJS what the Stars can do for fund raising. My hat of to all the people involved. what a great weekend! 2 dominating wins. was a blast to be in the Icebox with all my hockey friends. and the auction was a lot of fun. Dzingel's dance, McCarron's rap and Hibbler's train dance were simply awesome! Thanks for the b-day wish. I had a good time but I may need to send the wife more as she seems to have better luck than I. Yeti , you do a great job with the blog keep up the good work. I know the year has been a little rough but I appreciate the support the fans show these kids.